Reclaim your space and customise your pad with a cool book of room makeovers. Transform your room in an afternoon! This book is crammed with fantastic ideas to make your room truly your own, from funky decorative themes to cool craft ideas. 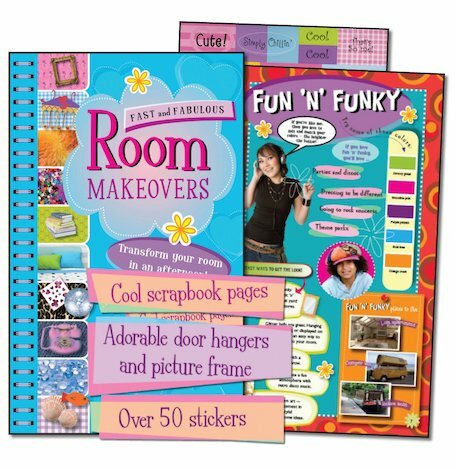 There are scrapbook pages where you can sketch out design concepts, plus picture frames, door hangers and over 50 stickers. Make your decorating dreams come true! very good for room makeovers. I thought this book was going to be good but when i got it it was very bad because it didnt have that much stuff in it. i gonna buy this book on monday . IM SO LUCKYYYY!!!!!!! I don’t rally like this book, because I think it’s usless. I want to see what’s in it so … I want it then BOOKS ROCK! i have not read it But I will!!!!!!!!!!!!!!!!!!!!!!!!!!!!!!!!!!! !